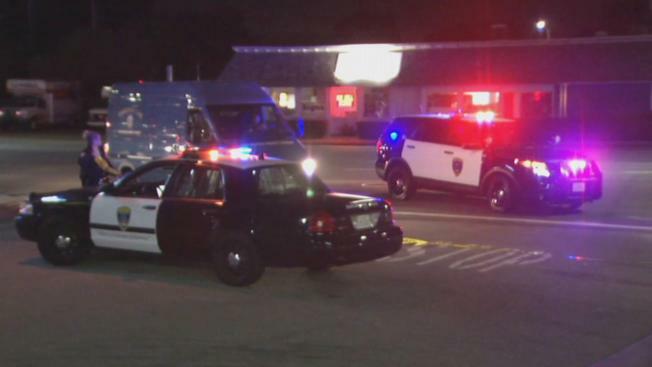 A 31-year-old man was shot dead Tuesday night near the Hillsdale Shopping Center in San Mateo, and two suspects were arrested in San Francisco after a high-speed chase, according to the San Mateo Police Department. The shootiing occurred just before 7 p.m. in the 3500 block of El Camino Real in a parking lot, police said. When officers arrived, they found the man suffering from multiple gunshot wounds. Medical aid was immediately started, but the victim died at the scene, police said. The suspect vehicle fled the scene and sparked a high-speed chase involving police and California Highway Patrol officers, police said. The pursuit reached speeds of about 90 mph as it traveled north on Interstate 280 to Interstate 380 then north on Highway 101 to San Francisco. Officers were able to stop the vehicle and safely detain two suspects near Market Street and Octavia, police said. Police warned the public to avoid the area near the shooting while San Mateo police investigate the scene. They said it appears to be an isolated incident. Neither the victim not the suspects were identified. Anyone who has information that may help in the case is asked to contact Detective Nick Ryan at (650) 522-7670 or call the SMPD Secret Witness Line at (650)522-7676. Anonymous online tips can be left at http://tinyurl.com/SMPDTips.